Want a big-name poker player to freeroll your WSOP action? Then check out Kathy Liebert’s twitter contest, which you can read more about in the Weekly Flop. We all know the Rio as the home of the world’s biggest poker extravaganza – the WSOP. But just recently, it was also the site of a grisly scene where police tased, shot and killed a man whom they suspect has pulled off various robberies in the Vegas area. According to authorities, the man went into several casinos, pulled a gun on the clerk, claimed he had explosives on him, and robbed them of cash. The police, who’d been tracking the bandit, tailed him to the Rio. When “he did not comply with their commands,” they tased him, which was “ineffective.” During a struggle with the detectives, the robber was fatally shot when he reached into his waistband (presumably for a gun). The Las Vegas Fire Department’s bomb squad showed up to the scene and determined that everything was safe. As for details on the other robberies, the Las Vegas Review-Journal reports that this information will be available at a later date. Poker player Jeffrey Vanchiro, better known as Gamblero, is one of the most-diehard Brooklyn Nets fans in the world. In fact, he’s actually become well known for wearing neon shirts under his jerseys, dancing in the aisleways and being loud and boisterous. 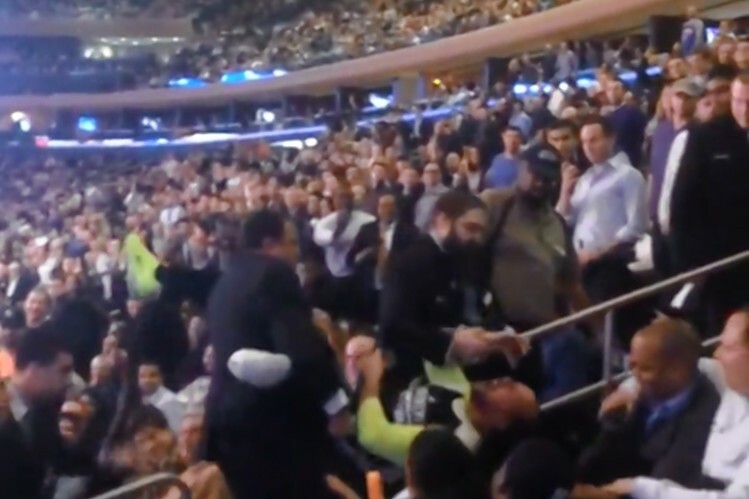 In a recent game against the Atlanta Hawks, other fans thought Gambler was being a little too loud and reported him to Madison Square Garden security. Vanchiro also tells New York Daily News that he has “bumps and bruises” from how he was handled by security. “I’m not a bad guy. I’m not a bad guy,” Vanchiro adds. “Did I think I was gonna get arrested? No, because I didn’t break the law. Is annoying people a crime? Is it? I would hope not.” Despite not liking how he was dealt with, Gamblero says he has no plans to sue MSG. There are already plenty of responses, with Phil Gordon chiming in by tweeting, “no doubt really: aggression and patience, with resiliency and courage as kickers.” Great answer Phil, but Liebert unfortunately isn’t taking it because Gordon is too rich. As for any other amateurs who are trying to scrape together $10k, the WSOP freeroll contest is still open on Liebert’s twitter.